Claim Construction: The PTAB has recently begun performing “standard” claim construction during inter partes review proceedings – rather than the broadest reasonable interpretation. This case, however falls under the old regime. A modular artificial tree, comprising: . . . Even applying the broadest-reasonable-interpretation, the PTAB found the phrase limiting — and construed it to require “a tree constructed of modular portions, each modular portion being a separate tree section” with pre-attached branches. The cited prior art references all had branches that separately attached to the trunk — and thus did not provide a prior art teaching of the pre-attached branchs. 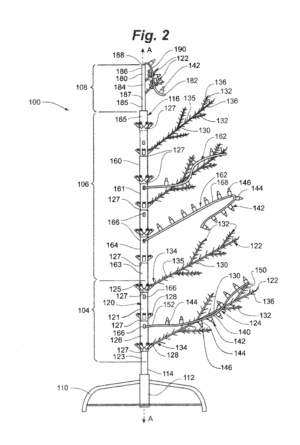 On appeal, the Federal Circuit rejected this construction — finding that it “does not represent the broadest reasonable interpretation of ‘modular artificial tree. '” None of the claims require branches, and the proffered expert testimony regarding the term’s meaning was “conclusory” and “unsupported” by corroborating evidence. Relying on the testimony of Willis’s expert, Dr. Brown, the Board concluded that a modular tree is “a ‘distinct’ type of artificial tree with tree sections that come ‘with branches pre-attached to the trunk.’” . . .
On remand, the Board will consider whether this change alters the non-obviousness conclusion. 1. The panel properly construed “tree portion” under BRI with a thorough well-reasoned 12 page analysis. This construction distinguished the invention from the prior art. 2. The patent owner advanced the same construction, thereby disclaiming any interpretation that reads on the prior art. 3. BRI is not the proper approach to claim construction under the current rules. 4. Claims that are ambiguous should be construed to uphold validity under the current rules (citing Phillips). 5. The patent owner is saddled with another $500K if they want to keep their patent through a remand. 6. The infringer and the Federal Circuit have effectively accused the inventor and the examiner and the PTAB of claiming more than was invented, even while the inventor denies and disclaims that excess scope. 7. The U.S. Patent System is a global embarrassment. The gauntlet is unfathomable. The inventor has to win in examination, win in reexamination, win 1st IPR, win 2nd IPR, win 3rd IPR, win IPR appeal, win on MSJ, win at trial, win on JMOL, win on appeal, win on remand. If he loses once it’s over. The cost to win all the way – 10 years and $30M. Forget about inventing. Just file or buy 100 patents with 2000 claims, doesn’t matter if there is an invention or not. Sue a bunch of companies. Venue doesn’t matter. Get past Rule 12(b)6 and make ’em pay you some money. I understand now that is how the U.S. patent system works. Nice. Forget about inventing. Just file or buy 100 patents with 2000 claims, doesn’t matter if there is an invention or not. Sue a bunch of companies. Venue doesn’t matter. Welcome to Plano, Texas! Land of opportunity. The patent owner is saddled with another $500K if they want to keep their patent through a remand. Or they can just donate their junk patent to the public and compete like most every other business on the planet. the inventor denies and disclaims that excess scope. LOL That’s not how it works. If you want to avoid “excess scope” then write a narrower claim, or hire a competent attorney to help you write one. The U.S. Patent System is a global embarrassment. That may be the case but it’s not for the reasons that you think. Says the guy with 8 kids. Funny stuff. Find something to do with your life. Trash talk and trash thinking from—who else–MM. The “trash talk” in this case was paid for by the patentee who correctly foresaw that its claims were going to be invalidated unless it hired an “expert” (in what?? modular Christmas trees?) to create an issue where none otherwise existed. The cited prior art references all had branches that separately attached to the trunk — and thus did not provide a prior art teaching of the pre-attached branches. Pre-attached branches! What will they think of next? Maybe someone will figure out a way to make a model Godzilla with the claws pre-attached to the hands. Except now there will be no motivation to do that because the patent protection has likely been taken away by the communist patent-hating Federal Circuit. Years from now the Godzilla model arts in the US will have totally ceased to progress while the Godzilla model arts in countries with robust patent systems will be light years ahead. People will wonder how that happened. Well, THIS IS WHY. They weren’t arguing they were the first to come up with a “modular” artificial tree — just that “modular” artificial trees are different from artificial trees where you have to attach each branch. So a reference relating to a tree where each branch is attached separately is not a teaching of a “modular” tree. Having owned both kinds of artificial trees, I would agree. “Modular” doesn’t carry that much weight, unfortunately. Either define the term, or write better claims. Note that “none of the claims require branches”. And literally nobody has the time to waste reading the specification to discover what we all know: the specification also doesn’t support such a limited definition of modular. The use of “experts-for-hire” to create fact issues where none exist is a deep flaw in our system. The claim says “up” but it would be better if it said “down”? Gosh, let’s just pay Dr. Expert to testify that “up” means “down”! Take that, PTAB! All that said, the idea that “pre-attached branches” could render an otherwise obvious claim to a fake Xmas tree non-obvious in the 21st century is an idea that should shock the conscience of any reasonable patent attorney. Then again, we live in a world where patent attorneys think they are entitled to millions of dollars because they dreamed up something that a programmable computer could display “automatically” in response to some specified kind of data. It’s appalling is what it is. Get into a line of work in which your cognitive dissonance does not overwhelm your feelings and you grouse incessantly over those hurt feelings of yours. 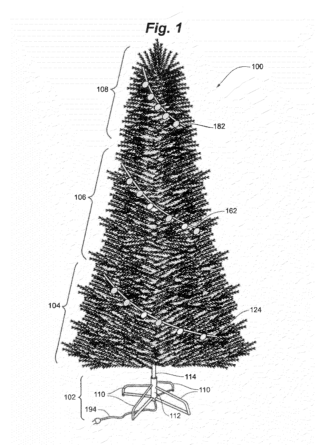 Because the artificial Christmas tree arts will never progress if we keep raising the patentability bar so absurdly high! These branches were pre-attached which is a pretty ridiculous concept all by myself. Now if you’ll excuse me I’m going to return to sipping tea out of my incredible modular mug with its pre-attached handle and sensor/transmitter that tells my phone the weight and distance being lifted every time I sip (the collected data is viewable on my iPhone when I want, where I want, thanks to Turbonic Plane Level (TM) Parameter Control Tech). You are not addressing what cognitive dissonance means with your follow on comments exhibiting a monomania against certain types of innovation. Maybe you think that you are making a point. The point you are making is not likely the point that you think that you are making. I don’t believe you understand the concept of a modular Christmas tree — at least “modular” in the sense of what the applicant intended. I remember the first modular Christmas tree I owned. I was amazed at the difference in how easy it was to set up, take down, and store, as compared to the old style of artificial trees, where the branches were not pre-attached to the trunk. In case you don’t know, in a modular artificial tree, the branches are attached to the trunk pieces via a hinge mechanism, so that when the trunk pieces are disassembled, the branches connected to the trunk piece are folded up and positioned along-side the trunk piece. When set up, the branches all simply unfold from the trunk to their typical “tree-like” position. It is actually a pretty useful concept. The branches are not “attached” to the trunk pieces in the way the handle on your tea mug is attached.